So… you have missing teeth and you’ve decided you’re ready to do something about it! Here at Ian Barwick, DMD we understand that losing teeth, or dealing with already missing teeth, can be an emotional and physical challenge. We are committed to helping you evaluate the solution that works best for your situation… and your budget! Give us a call and we’ll arrange a free consultation to discuss solutions to your “open space” problem! A visit to our practice, Ian Barwick, DMD will help you to evaluate the solution that works best for your situation… and your budget! Give us a call and we’ll arrange a consultation to discuss solutions to your “open space” problem! 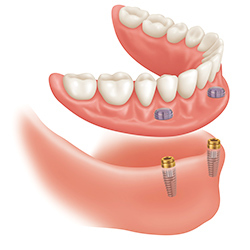 All dentures may require that some teeth be pulled removed, or that some surgery be performed on the bony ridges beneath the gums to better accommodate your new dentures so they have a perfect “feel and fit. If you’re ready to discuss dentures, then so are we. Of course there may be other options available as well, but we won’t know for sure until we see you! So give Ian Barwick, DMD a call to schedule an examination and consultation. Don’t you agree it’s about time?